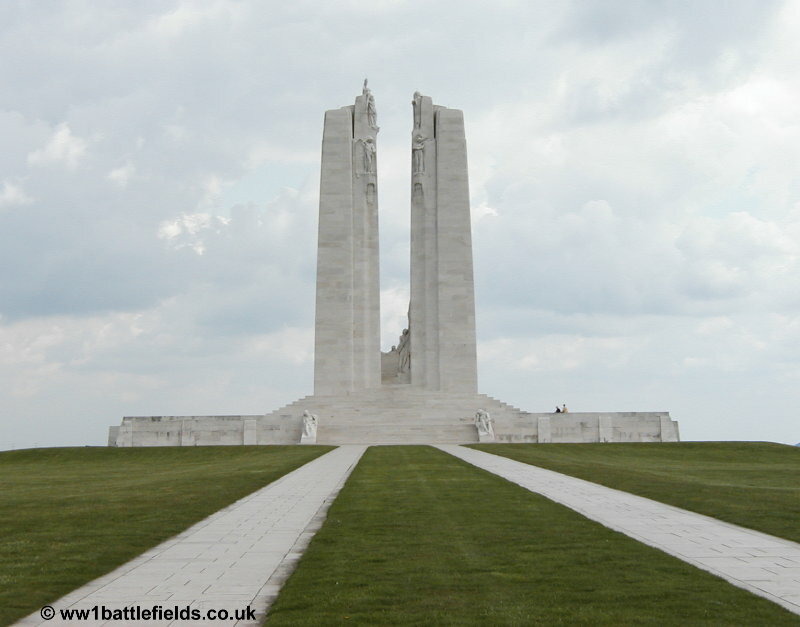 This page covers Vimy Ridge itself; the memorial, the tunnels, cemeteries and other sites within the preserved battlefield area. Vimy Ridge is located about 5 miles north of Arras, near Lens, and is conveniently en route from the Channel ports if you are traveling to the Somme. The Park is well signposted. There are also many other sites of interest, many particularly relevant to Canadians, in the villages and area around Vimy Ridge. A separate page covers the area around Vimy, and a really good guidebook covering the sights on and around Vimy Ridge, plus other areas, is the Holt’s Battlefield Guide to the Western Front: North. The attack at Vimy Ridge which was undertaken by the Canadian Corps (of the First Army) on Easter Monday, the 9th of April, 1917, is often seen as the first unequivocal success gained by the Allied (in this case Canadian) forces during the course of trench warfare. The Germans had held the heights at Vimy Ridge since the trench lines settled in late 1914, and the French (who then held this part of the line) had failed in attempts to take it in May and September of 1915. The sector was taken over by the British early in 1916. The attack at Vimy was part of an offensive mounted primarily to draw the German’s attention from a major French offensive on the Aisne, which was launched a week after Vimy on the 16th of April, 1917. However, the French attack was not the major breakthrough that had been hoped for by their Commander, Nivelle. The Canadian Corps in April 1917 was commanded by General Julian Byng, who later rose to command the Third Army. After the War in 1919 he received a peerage, as the first Viscount of Vimy and Thorpe-le-Soken. Later he was Governor General of Canada from 1921 to 1926. 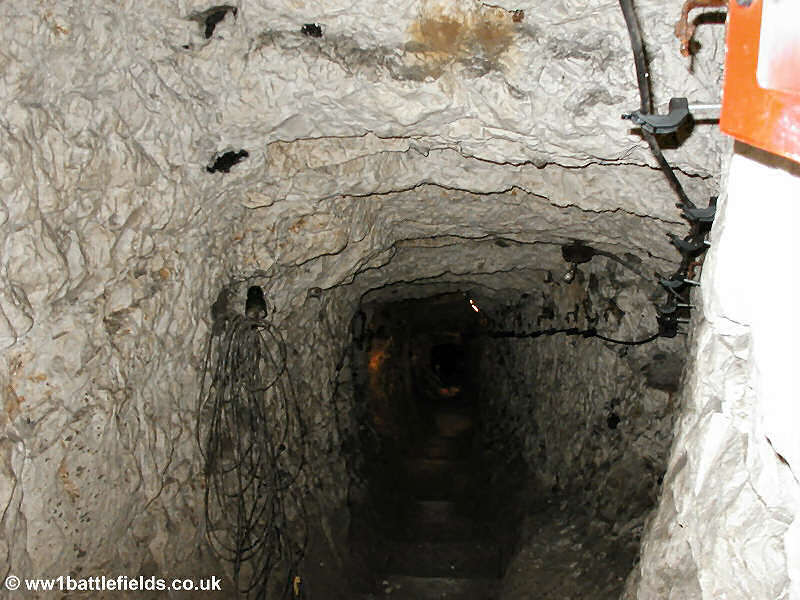 Like Messines, the prior planning for the assault was extremely thorough, leaving little to chance, and included the use of tunnels to bring attacking troops up to the front lines with less risk to them and less warning for the Germans. Air superiority was also an important factor, although achieved at considerable cost – the number of aircraft lost led to the month being known as ‘Bloody April’ by the Royal Flying Corps. The air offensive began on the 4th of April, timed to coincide with a massive artillery bombardment, although this was hindered by poor weather. Over the five days of the 4th to the 8th of April, the RFC lost 75 aircraft and 105 men – 19 killed, 13 wounded and 73 reported missing. 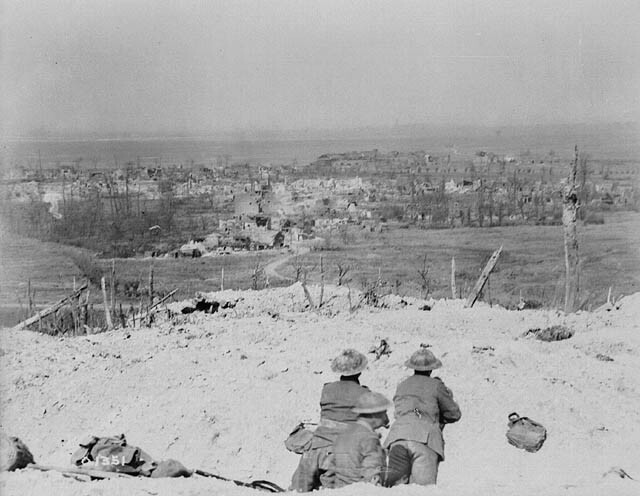 The weather on the day of the attack (which was carried out at 5.30 a.m.) was poor, with snow and rainstorms, but the attack was a great success, not only in gaining for the Allies the commanding position on the heights – and you only have to stand here to appreciate what that meant – but also in drawing German reserves away from the planned French offensive on the Aisne. In recognition of the Canadian achievements here, April the 9th was in 2003 declared a national Day of Remembrance in Canada to mark the anniversary of the battle. Vimy Ridge is now owned by the Canadian Government, and the site is maintained as a memorial to the Canadian Forces who fought in the Great War. 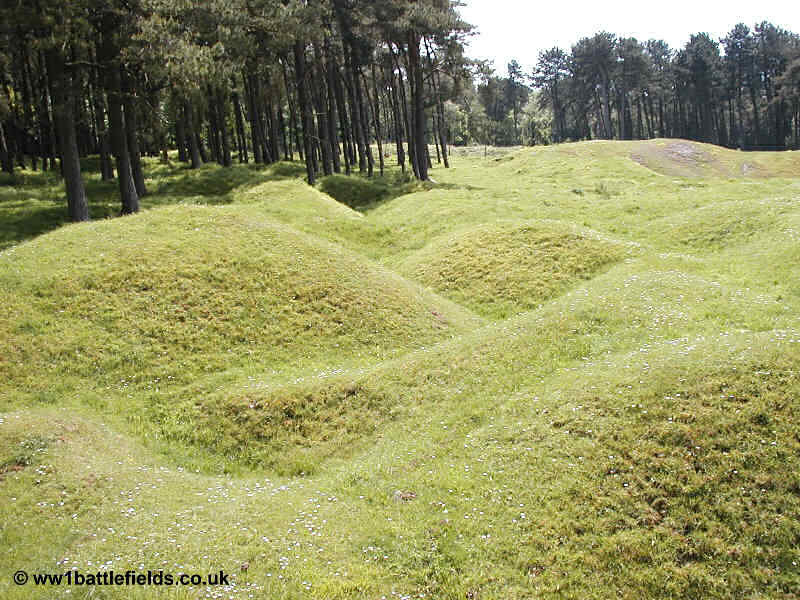 There are two main areas which are most visited – the site of the Memorial, and the area of preserved trenches. There are separate parking areas near both, although it is only about a 15 minute walk between the two. From the car park nearest the memorial, paths lead up to it and the Canadian and French flags fly. Standing by the memorial itself one can see for miles across the plains, past the slag heaps of Lens, including the twin slagheaps of the Double Crassier (see photo below). These are now larger than they were during the War, but driving in this region of France many similar smaller slagheaps can be seen – they are a feature of this area. The Vimy Ridge Memorial itself is a stunning piece of architecture, dominating the landscape for miles around. It was opened in 1936 and a major restoration programme took place in 2006. 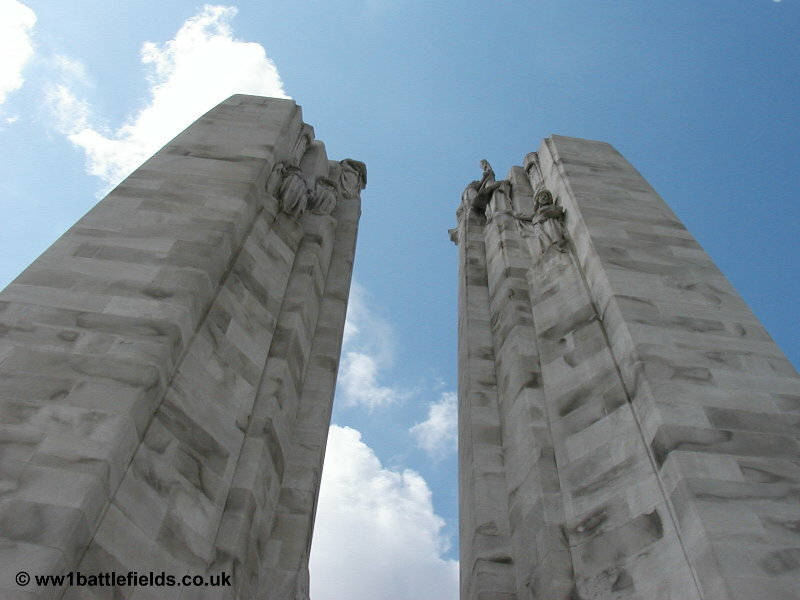 The memorial is in the form of two large pylons, and is carved from limestone, which stands out as almost white, especially in bright sunlight. 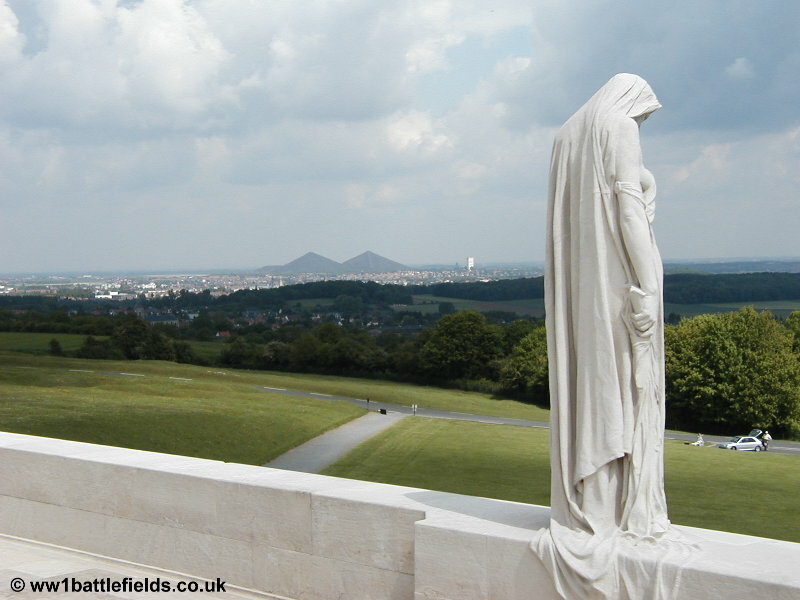 There are 20 figures sculpted as part of the memorial, appearing on the sides and at the top of each of the pylons, and also there are figures around the base. One of the most striking is the weeping woman who looks out from the edge of the base, towards the double crassier. As at the Newfoundland Memorial Park at Beaumont Hamel on the Somme, ground in the memorial park has been left undisturbed, and there are trenches and shellholes clearly visible in the grass. 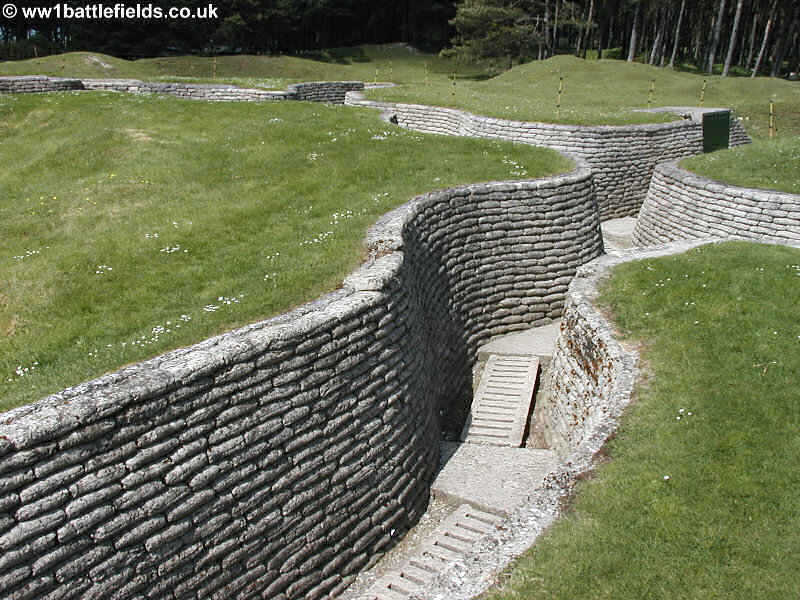 In one area, the trench outlines have been made more permanent by the addition of concrete “sandbags”, and you can walk along these trenches, which are deeper than those at Beaumont Hamel or Sanctuary Wood. Recently, a new centre has been opened next to these preserved trenches, and there is additional car parking here too. There are also nominal firesteps, and because this high land had such value, the trench lines were close together here. You can stand in either the German or the Canadian trenches, and see how close the enemy trenches were in this sector from the infantry soldier’s perspective. 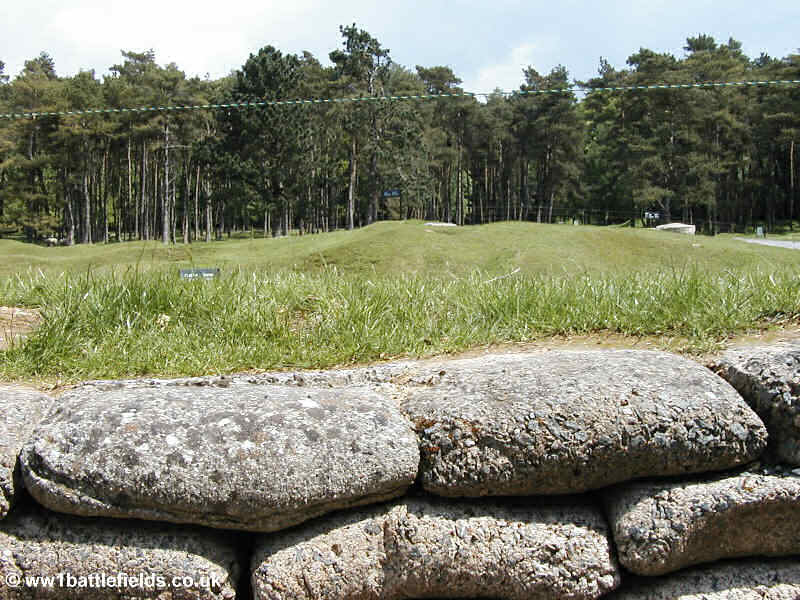 In this example below, the enemy lines were just before the trees (if you enlarge this image by clicking it, there is a green signboard elevated above the far trenches to show the opposing lines). There is not much distance separating them at all. A mortar bursting on the barbed wire at Vimy. Image from Library and Archives Canada. The park covers a large area, and as you walk or drive around it you are struck by the devastation caused here – and of course right across the Western Front, although in most places all traces have now vanished. But here at Vimy, although now grass-covered and grazed by sheep, rather than bare earth with twisted metal and the torn remains of soldiers, you can still see the shell craters and trenchlines from 90 years ago. One of the most interesting things to see at Vimy is Grange Tunnel. This is a network of underground passages, around which there are guided tours. These are only some of the tunnel networks that riddled this small part of the Western Front. They are astonishing. The tour lasts around 40 minutes, with guides usually being Canadian students. However, although the tour sticks to the main tunnel, you can see running off it many other branches, and the sheer scale of this impressed me hugely. 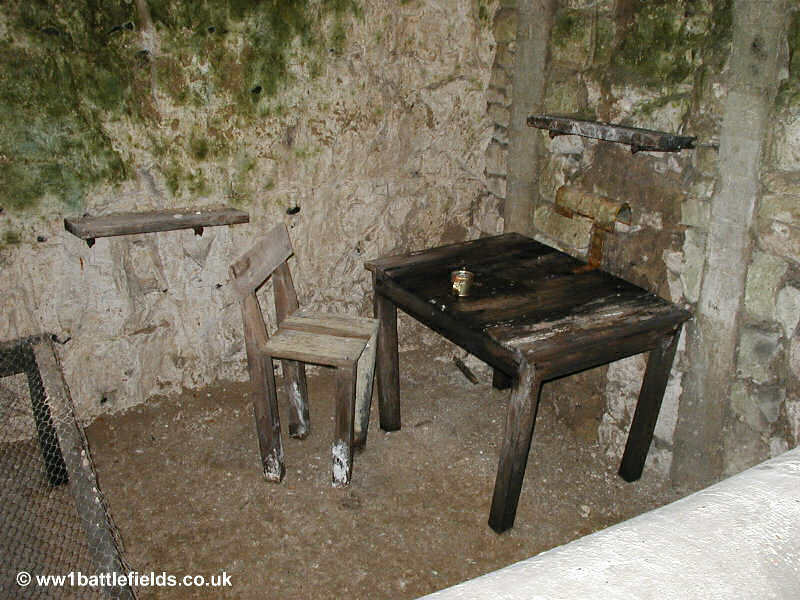 How many miles of tunnels were dug across the Western Front, and still remain under the ground? More information on Grange Tunnel, and on Vimy can be found at the Veteran Affairs Canada website. Down a small road running to the left as you drive through the park from Neuville St Vaast towards the memorial, are the two war cemeteries which are located within the Memorial Park. This small road ends in a one way loop, with the first cemetery directly ahead. This is Canadian Cemetery No. 2. There is a Maple Leaf on the cemetery gate although the burials here are not exclusively Canadian. As well as the many known Canadian and British soldiers buried here there are also many unknown burials. In fact, more than two-thirds of those buried in the cemetery are “Known Unto God”, as the inscription on their headstones reads. Although the cemetery was started just after the Canadians took Vimy Ridge in April 1917, the majority of the graves were moved here from elsewhere, over a period of years after the Armistice. They were either moved from smaller burial grounds, isolated graves or else were bodies recovered from the battlefield as the years went by. This explains the high proportion of unknown burials. Although the setting within the memorial park is fairly peaceful, the noise from the nearby A26 motorway can be clearly heard. The roads throughout the park are also popular with local joggers, and groups or individual runners pass every so often, especially in the mornings. Rows of headstones are positioned right against the walls of the cemetery at the front and on the sides, some way from the other graves in the cemetery. In many CWGC war cemeteries this layout is because these headstones are actually special memorials to soldiers either known or believed to be buried within that cemetery; here however most do mark actual burials (comprising Plots 19, 20 and 22). Special memorial ‘headstones’ form two short double rows on either side of the Great Cross, on the right side of the cemetery. In addition there are some special memorials which are by the wall right behind the Great Cross, with a Duhallow block indicating that these soldiers were killed in action in 1917, and buried then in two other Canadian Cemeteries near here; however, their graves were subsequently lost. Generally, this was either as a result of the graves being damaged or destroyed by later shellfire, or else when graves from the smaller cemeteries were moved, the location of some graves could not be found. Private Thomas Leatherbarrow is commemorated by one of these special memorials. He was born in Lancashire in England, but enlisted in Calgary in July 1915. He was aged 30 when he died on the 12th of April 1917, serving with the 50th Battalion, who took part in an attack on the 12th of April in front of Souchez, in what their war diary describes as a ‘blinding snowstorm’. However, the poor visibility meant they suffered relatively few casualties; one officer and three men (Leatherbarrow being one of these), although another eight were reported missing. On the other side of the short one-way loop is a contrasting cemetery. This is Givenchy Road Canadian Cemetery; a small, original wartime cemetery. It is also of an interesting design, with the stone wall surrounding it being circular. This may perhaps represent the fact that the burials were really a mass grave in a shell-hole, as can be seen at the Lichfield and Zivy Crater cemeteries near here, and described on the area around Vimy page. Perhaps the burials here were slightly more organised, as there are actually rows of headstones unlike at Lichfield and Zivy craters. There are two longer rows where the headstones are almost touching, and then a shorter row, and finally a single grave by itself comprises row D.
Despite the fact that all burials here are Canadians, there is no Maple Leaf symbol on the cemetery gate. The plan in the register shows a layout quite different from today. The layout used to include beds of flowering shrubs around the edge of the cemetery, and the plan shows this bed coming right up to the single grave in row D set by itself. This grave (which is that of Private Henry Kirkham) is also shown as right next to the entrance, but it is now set a little way back from this. Today there are no borders of flowering shrubs, apart from very small beds either side of the gate. Two seats are also marked on the plan; these too have gone. A small wooden cross was set in the earth by the grave of Private James Chalmers, remembering that he was originally from Walls, Orkney. His parents address there is given in the register. James Chalmers was an engineer who enlisted in Vancouver in November 1915, and was only 24 when he died. He was with the 54th Canadian Battalion, which was one of those that attacked at 5.30 a.m. on the 9th of April. They encountered strong resistance from a German strongpoint at Old Boot Sap, although they reached their objectives. The battalion on their left however did not, and the men of the 54th suffered from snipers on their unsupported left flank. They thus had to withdraw slightly. James Chalmers was one of around 100 men killed of the 350 who attacked that morning. The majority of those buried here died on the 9th of April 1917, and the remainder died in the few days after that. This cemetery was one of many small cemeteries made at that time, and was originally known as CD1 – these small cemeteries were given such short designations. As well as many sites in the area around Vimy, it is only around another 30 miles or so on to the Somme battlefields.